New classes in a revolutionary movement therapy are to start soon in the Lake District and Lancashire. Steve Cheslett, a practitioner of the Feldenkrais method, aims to help people move more freely and reduce stress. Steve, who is the only Feldenkrais practitioner in Lancashire and South Lakeland, is also a physiotherapist and works with stroke patients on their rehabilitation. More popular in America, Australia and continental Europe, Feldenkrais is only now having an impact in Britain, with students appreciating the holistic approach in helping the body to function more efficiently. “Feldenkrais concentrates on enabling the brain to improve the organisation of all the other systems such as neurological, and muscular-skeletal, in order for the whole to function well,” says Steve, who lives in Kendal. Steve, who has worked extensively in the NHS as a physiotherapist and has specialised in neurology and stroke rehabilitation, decided to train as a Feldenkrais practitioner after seeing the effect on a colleague whose life was changed “and she looked 15 years younger”. Benefits, he says, are relief from tension and muscular pain, easier and fuller breathing, greater relaxation and well-being, improved performance in sport, dance, music and drama, greater ease in everyday activities and increased vitality. He spent four years studying part-time, and now gives individual sessions, known as functional integration, as well as classes at Ambleside’s parish centre. He now plans to run further classes and regular workshops in Lancaster and the South Lakes, starting in September. The group classes are known as Awareness Through Movement lessons, verbally guided lessons where the students are led through structured movement sequences which are like movement puzzles. “There’s no competition and no achievement required – just the opportunity to pay attention, tune-in, sense and feel,” says Steve. He believes that the benefits are considerable for people of all ages, and that increased self-awareness can have an impact on improving posture and increasing the efficiency and comfort of movement, whatever the function. For details of classes, workshops and one to one sessions see his website: www.awarenessworks.co.uk or call 07854 645836. This entry was posted in Uncategorized on July 20, 2015 by Stagey Lady. Fitness instructor Ursula Brendling plans to mark her 50th birthday in style. She’s going to do her first ever triathlon, and she’s picked the world’s toughest event to make her debut. Ursula, who lives in Ambleside, has entered Triathlon X which moves into central Lakeland next year and will be based at Waterhead near Ambleside. Competitors will swim two miles in Windermere, complete a cycle route of 112 miles following the course of the Fred Whitton challenge, and run a mountain marathon to the top of Scafell Pike and back. Ursula will be raising funds for YHA’s bursary fund for disadvantaged young people, Breaks for Kids, which creates opportunities for young people to stay with YHA and have new, life-changing experiences. The organisers have also pledged £5 from each entry fee to the fund. “My friends keep asking me why I am doing the hardest triathlon first,” said Ursula. “I only intend to do one, so this has got to be it. I love the outdoors, I love exercise and I love a challenge, and the Triathlon X combines all three in bucketfuls. Ursula has been a fitness instructor for 21 years and uses a wide variety of methods to improve fitness, and vary individual workouts to constantly challenge and maintain motivation. She runs weekly outdoor bootcamps and fitness classes including circuits, interval training, “Kettlercise” and aerobics. She said: “I am in a lucky position to do a job I really enjoy. All my clients and class members impress me daily with their determination and effort to achieve their goals. I hope to use this training to further help and inspire them to see that anything is possible. Triathlon X will be staged on June 25 next year, and with steeper ascents and longer finishing times than any other extreme event, it is acknowledged as the toughest iron-distance race in the world. It is moving to Windermere after being staged successfully this summer at Wasdale where it attracted 133 competitors, of whom 98 finished. In a new partnership with YHA (England and Wales), the organisers have created a route which is already generating excitement among triathletes, and entries are already pouring in. For more information see http://www.wasdalex.co.uk. This entry was posted in Uncategorized on July 19, 2015 by Stagey Lady. The Bay Search and Rescue Team is leaping into action – for the north’s biggest fundraising gala event. The team will be one of three charities to benefit from the project 100-to-1 organised by Kendal photographer Glynis Bland which will be staged at The Villa at Levens in September. And they have joined in the effort with the help of their “tiny team”, a series of Lego figures which have a cult following on social media. 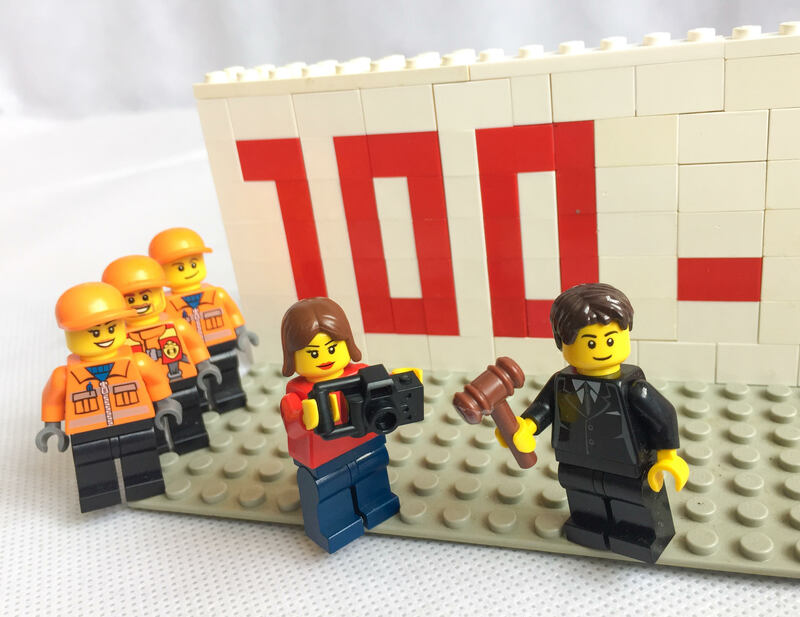 Team member Mike Davies, who creates the Lego scenes and posts them on Twitter, has made a miniature auctioneer – complete with hammer – in front of the fundraising logo. On Twitter the Tiny Team is “a miniature version of Bay SAR Team promoting the work of the bigger guys and girls”. Mike regularly posts photos of his creations, depicting the work of the rescuers. “It’s a really fun way to reach a different audience,” said deputy station officer Paul Calland. Bay Search and Rescue is operated as a charity and was founded in 1999. The team is committed to providing all-terrain rescue vehicle support on and around the Morecambe Bay, the Lake District and North Lancashire area to HM Coastguard, North West Ambulance Service, Cumbria Fire & Rescue Service, and other agencies. They are well known for their rescue work on the Morecambe Bay sands. The team was chosen by Glynis, along with Alder Hey Children’s Hospital and Macmillan Cancer, to benefit from her fundraising project. She has taken photographs of people born in the hundred years from 1915 to 2014, and a collage of all the portraits will be revealed at the gala event at The Villa. A book of the photos will also be published. The gala event will feature live music, stalls, raffles, and a grand charity auction for which offers are already pouring in from local businesses. Bay Search and Rescue specialises in rescue and recovery from quicksand, swiftwater, floodwater, snow and ice using a fleet of all terrain amphibious rescue vehicles, 4x4s, support vehicles and trained personnel. They also search for missing people, and assist the fire services with large animal rescue and wildfire incident support. This entry was posted in Uncategorized on July 14, 2015 by Stagey Lady. An unusual production of one of Shakespeare’s plays will be performed in the gardens at Rydal Mount near Ambleside next week. The Three Inch Fools company will stage The Tempest in the grounds of William Wordsworth’s home, in the gardens that the poet designed. And the touring company will set up camp next door at the Rydal Hall campsite, staying in their own tepee, and using home-made costumes and props. “We are a troupe of travelling actors in the true Shakespeare tradition,” said James Hyde, who founded the company with his brother Stephen earlier this year. 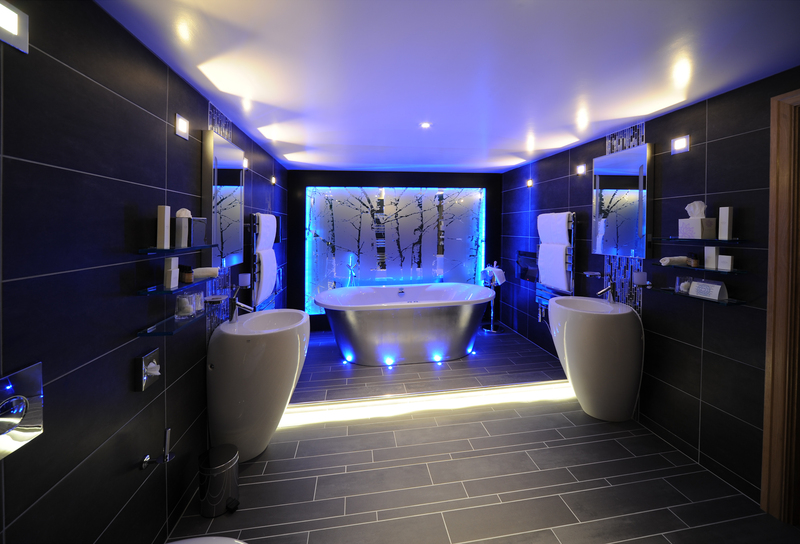 This is their first tour, and takes in locations in Northumberland and Scotland as swell as the Lake District. In The Tempest, magic and the supernatural come to life in a tale of monsters, drunken butlers and stormy seas. The performances at Rydal Mount are on August 19 and 20. Tickets at the door £12.50/ concs £10. This entry was posted in Uncategorized on July 10, 2015 by Stagey Lady. Experts and devotees of William Wordsworth will gather at Rydal Hall near Ambleside next month for their annual conference. Some 70 people – academics, poets, writers and enthusiasts – will spend ten days listening to lectures and hearing research papers presented. They will stay at the Hall – one of the most magnificent buildings in the Lake District – and enjoy the 34 acres of grounds. They will also attend receptions at Wordsworth’s home at nearby Rydal Mount, and at the Wordsworth Trust (the Jerwood Centre and Dove Cottage) in Grasmere. Richard Gravil, chairman of the Wordsworth Conference Foundation, said that Rydal Hall was an ideal venue. “There’s an excellent amount of space, a good choice of lecture rooms, a youth centre for postgraduates on bursaries, plenty of room to socialise, and the superb grounds. Rydal Hall, built by the Le Fleming family and now a retreat and conference centre run by the Diocese of Carlisle, also has holiday accommodation along with a camp site, eco-pods and a resident artist based in a yurt. There are also art exhibitions in the Old School Room tea shop, and an art and sculpture trail in the grounds. This entry was posted in Uncategorized on July 9, 2015 by Stagey Lady. A young artist from Milnthorpe has found a new way to pay tribute to William Wordsworth. Rebecca Bennett has painted the words of Daffodils (I wandered lonely as a cloud) and other poems onto silk scarves. 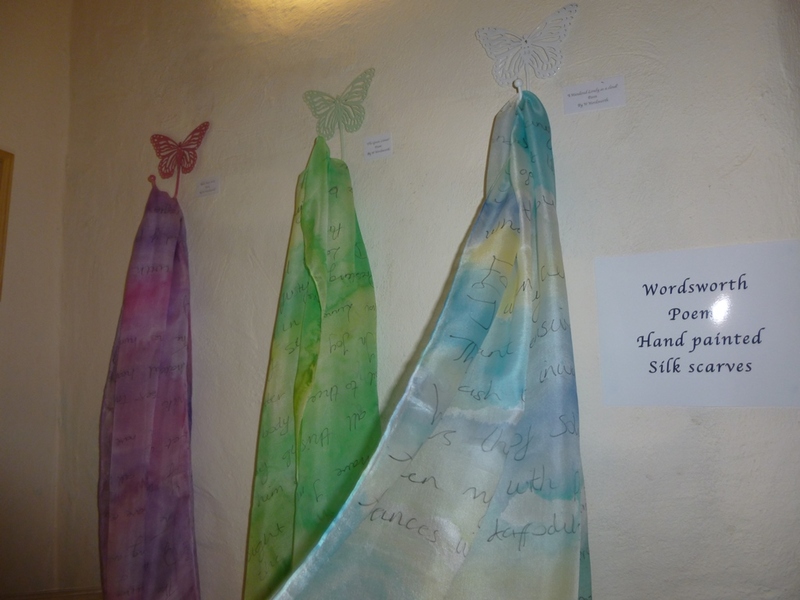 The scarves are on display in a show of Rebecca’s work at the Old School Room tea shop at Rydal Hall. They form part of an exhibition of her exquisitely delicate paintings on silk, including wild life, landscapes, flowers and birds. 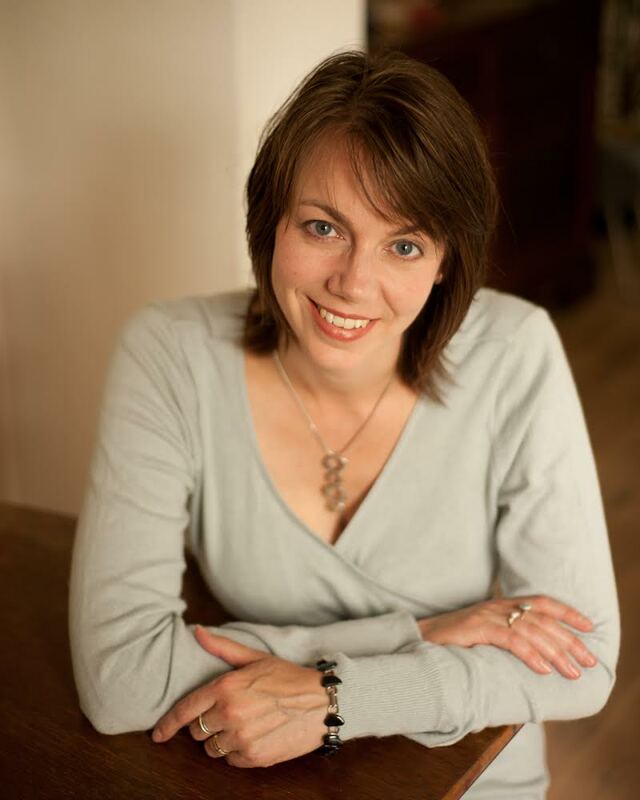 Rebecca, who works part time in an art gallery, has a degree in contemporary applied art. The pictures, scarves and greetings cards at Rydal are also for sale. The exhibition runs until the end of August. The Old School Room tea shop is open daily from 10am to 5pm. This entry was posted in Uncategorized on July 7, 2015 by Stagey Lady.